← Summer in the Heart by John McMillan Book Blitz – Win a $25 Amazon Gift Card! 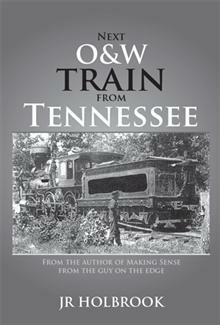 Next O&W Train From Tennessee by JR Holbrook Book Blitz – Win a $25 Amazon Gift Card! James Holbrook is the great-great-grandson of Nancy Moody. Nancy Moody was the daughter of Charlot Moody and Johnathon Moody-Johnathon Moody was killed in the Civil War-Nancy Moody being the mother of Armeldia Moody and the grandmother of Raymond Wright, Selby Wright, Clara, Cora, and Edith. This is the second short story of James Holbrook, who also published Making Sense in 2011. James graduated from Sullivan University in 2008 with honors and decided to try the option of writing some short stories and children’s books. What James likes most about writing is creative expression. is also in his book.